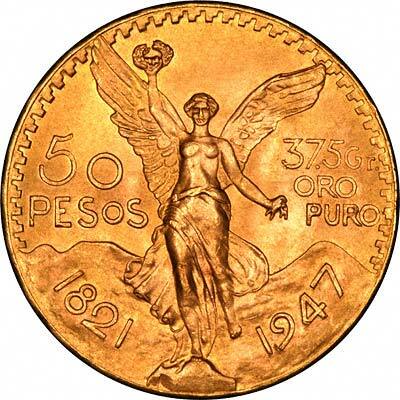 Before the Krugerrand was introduced in 1967, one of the few large world bullion coins was the 50 Pesos from Mexico. This was issued from 1921 to 1947, although close to 4 million more were issued between 1949 and 1972 which were almost certainly all dated 1947. It is interesting to note that the 1943 coin has got a slightly different design. The weight is repeated on the left and right of the figure, and the denomination in omitted. We do not know whether this was an error, but it only occurs on coin of this one year. Sample prices based on gold at £600 per ounce. The following prices are subject to gold bullion price fluctuations and exchange rate changes. Because of gold bullion price fluctuations, our selling prices on these and most bullion coins are subject to change without notice. Please don't let this stop you from ordering, we will do our best to meet your order. You can always check the current price with us before ordering. One of our customers has just returned from a holiday in Mexico, and phoned us to compare prices. 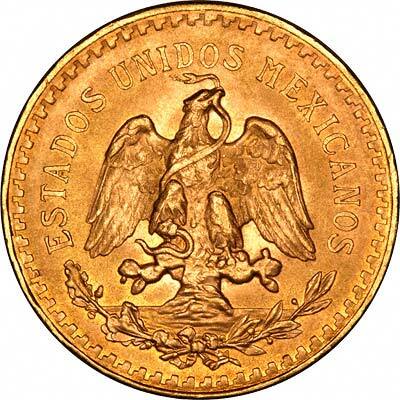 The prices in Mexico ranged from $500 to $800 U.S., which works out at current exchange rates at £357 to £571. Our price on the day was £263. If you bought 10 of them from us (£251 each), you would save enough money for a holiday in Mexico!